Honey is one of the most natural substances known to humans since ancient times. It is a thick, gluey and sweet tasting liquid. Honeybees collect nectar from flowers and store it in their hive, where it is processed with their digestive juices. It is then extracted using traditional methods or a mechanical honey extractor. Although honey is preferred in its raw form, commercially you can also find pasteurized, strained, ultrasonicated and dried honey. While buying honey make sure you check the expiry date and possibly opt for organic honey. Organic honey refers to the honey or honey combs produced, processed, and packaged in accordance with national regulations. Honey is a natural energy booster and immunity builder. It has anti-bacterial and anti-fungal properties. It helps to lower cholesterol level, it also helps in increasing antioxidants in the blood and so it helps prevent heart diseases. Honey helps in reducing throat irritation and cough. It is the main ingredient in many home-made kadha / healthy hot drinks which work wonders for body. It is superior in maintaining glycogen levels and improving recovery time than other sweeteners. This chia seed drink with honey and lime triggers energy in body and makes an amazing food for endurance athelets. Making salad dressing from scratch is a very quick process. They can be then stored in an air-tight container in the refrigerator and used whenever required. Quit buying bottled dressing and try your hands on these flavorful dressings made using a combination of honey and mustard , honey and lemon or a minty honey dressing and create beautiful salads mixing exotic ingredients, millets and sprouts. Don't forget to pack the dressing separately and toss the two together just before eating. Honey enhances browning and crispness, and is hence great for glazing roasted and baked foods to promote surface browning. Try these coconut flour or almond flax bread which are gluten-free and makes an ideal snack. Nothing can beat the heavenly combination of dates,oats and mixed berries granola bars. Replace your jars of deep-fried snacks with these healthy bars when your hunger strikes.They are made using honey which binds all the ingredients and adds sweetness to it. 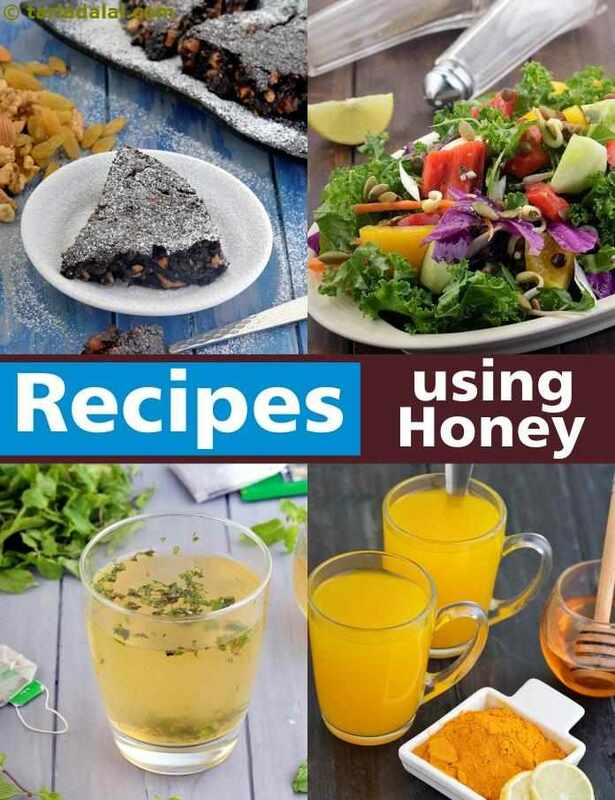 Honey provides binding due to its viscosity, and aids in shaping of desserts. It retains moisture, an essential ingredient for prolonging moisture retention in rich cakes. Treat your loved ones with this chocolate nut cake or chocolate mousse cake which is really easy to make and an ambrosia for every chocolate lover! A delectable shake that will instantly refuel a tired child once he's back from school.